Goalpara, Purulia, Korukonda and Gorakh. 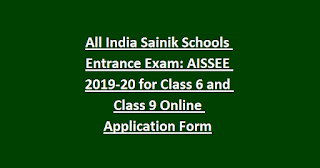 Only boys are allowed to apply for this Sainik School Entrance Exam 2019. Selection for these Sainik Schools seats will be based written exam and physical tests. Last date to submission of application online for this sainik schools entrance exam is 01-12-2018. AISSEE Exam will be held on 06-01-2019. Sainik School Entrance Exam Result will be given on 04-02-2019. 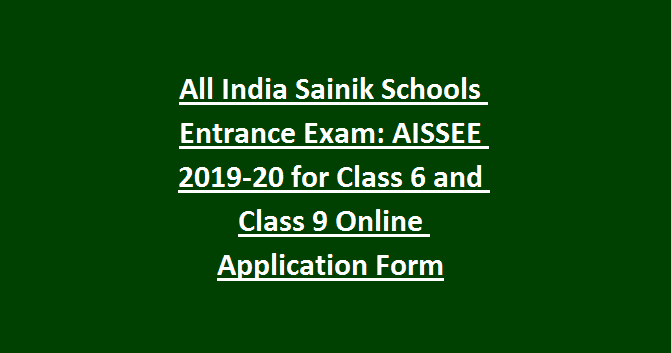 Candidates who are studying 5th grade they are eligible for 6th class AISSEE Exam 2019. Those who are studying 8th class they are eligible for applying 9th class AISSE Exam. For Class 6th Entrance Exam 10-12 years having candidates are eligible to apply. Those who born in between 01-04-2007 to 31-03-2009 they can apply for 6th class entrance exam. For Class 9th Entrance Exam 13-15 years of age having candidates are eligible to apply. Those who born in between 01-04-2004 to 31-03-2006 they can apply for 9th class entrance exam. Merit list is prepared based on marks in the entrance test. The final selection will be done after the medical examinations are conducted. For 6th class entrance written exam will be conducted for 300 marks. For 9th class entrance written exam will be conducted for 400 marks. How merit list will be prepared for Sainik School Entrance Exam 2019? Based on Sainik Schools Entrance Exam marks only merit list will be prepared for these AISSEE Exam. If any two students get equal marks preference will be given for Mathematics subject marks. If still marks are same then Intelligence test marks will be considered for 6th class and English marks will be considered for 9th class marks. Even these are same then language marks are considered for 6th class and General Science marks will be considered for 9th marks. If all the above same are then finally students age will be considered. Less age limit having candidates only considered merit list. Interested candidates can get the application before the closing date of 26-11-2018. Last date to reach the application to respective sainik school is 01-12-2018.